New Dawn provides resources and unique opportunities to developing youth. We support specialized mentorship programs on both a local and international scale. By fostering resiliency in underprivileged youth, we enable them to overcome risk factors and feel empowered to pursue their aspirations, and prepare them for a successful, fulfilling future. We aim to assist young people in developing leadership skills they can take back and apply in their communities. Our emphasis is on team building, non-violent conflict resolution, and the development of self-confidence and skills of self-expression. "This is far more than giving material things,it's about providing an uplifting experience." 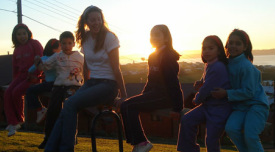 Following the 2010 earthquake that struck the Bio-bio region of Chile, American model Briana Holmer paired up with the New Dawn Foundation to carry out an empowering reconciliation project for Nuevo Amenecer, a SENAME youth protection center located in the coastal city of Concepcion. After repairing the center's soccer field that had been damaged by the quake, mentorship designed around the youths' favorite pastime began. The young teens were engaged in a creative jersey screen print project and spent the afternoons practicing soccer footwork. Professional soccer players from the local Deportes Concepcion team joined the youth group for one on one mentorship and a fun and friendly match. The children were presented with jerseys, soccer balls, and gift bags. "This is far more than giving material things, it's about providing an uplifting experience," Miss Holmer said when asked about the event. "I believe in the potential of sports as a platform to dream, grow and learn about life. The support and encouragement these young adults received from their mentors, the feelings that were generated through the experience; these are the elements that will bring them closer to the realization of their dreams."